For Week 5, the PICS baking class as usual made 3 pastry products. However for the purpose of this post, I've reduced it to just focus on one item. 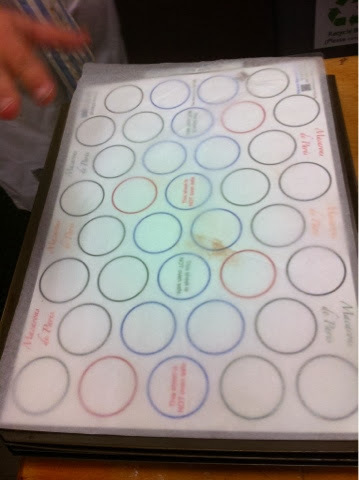 But anyways, here are some pictures of this product made in progress so my readers have an idea of the process that goes through when making macarons. 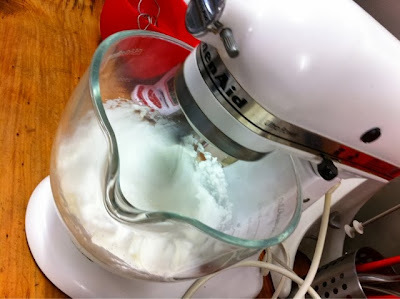 About two to three days before class, break and separate 2 egg whites into a container. You may keep it in the fridge that it keep. This batch allows you to make 2 serves of a baking tray size. The reason for this is allow the egg whites to oxidate. In many baking products, almond meal/ground almond/ almond powder is used. The above is equal amounts of almond meal mixed with icing sugar and cocoa powder. 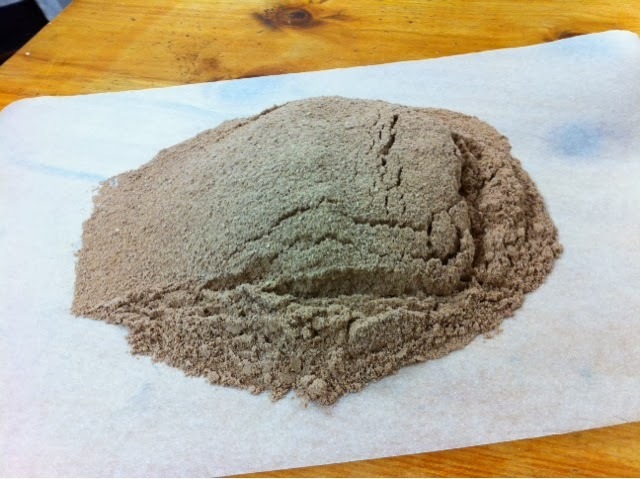 Almond meal is ordinarily light brown in colour and for macarons, almond meal without the brown husk is used. This combination is called 'tant pour tant'. For the beaten egg white meringue, it is beaten as usual. 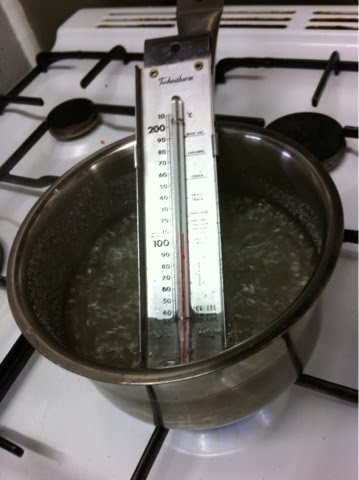 However boiled caster sugar and water, measured using a sugar thermometer to measure the preciseness of the temperature of 115 degrees Celsius is needed. Pour the sugar syrup into the egg white. This apparently is what is called "Italian Meringue". and more stabilized before folding it into the Tant Pour Tant mixture. 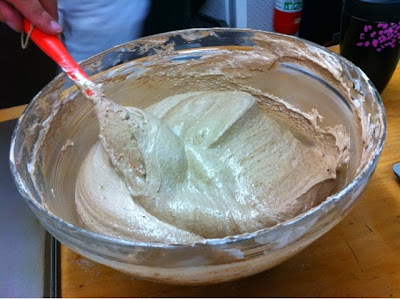 Combine the egg white meringue with the 'tant pour rant' using a silicone spoon. 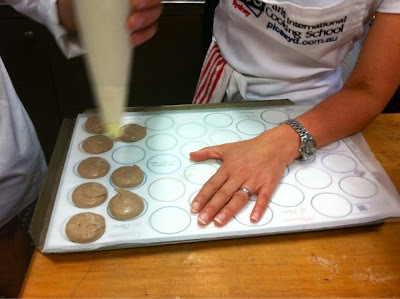 Using piping bag, pipe macaron mixture onto baking papers on 2 baking trays. Leave it to 'crust' for 1 hour. Then bake in pre warmed oven at 150 Celsius for 20 mins on oven top shelve. (Line cooking with 2 extra empty baking trays) then move single baking tray to lower level to allow macaron to dry for a further 10-20 mins. Remove from tray and leave to cool. They are ready to assemble after 24 hours. So, the above instructions seem really complicated.... And very time consuming.